What is the X_TRADER® Impact? Can I migrate existing workspaces? Yes. Since price series keys are not changing, existing workspaces may be used. How do I manage working orders during migration? Prior to migration, traders must cancel all working orders, including GTC, GTD, and GTDate orders entered for CFE products. Will spreads in Autospreader that include CFE products have to be deleted in advance of the migration and rebuilt after migration? No. Since price series keys are not changing, existing spreads may be used. What is the impact to X_TRADER® Plug-ins? Is there impact to RTD? What is the X_RISK Impact? What if I currently use an X_RISK Historical Fill Server (HFS)? 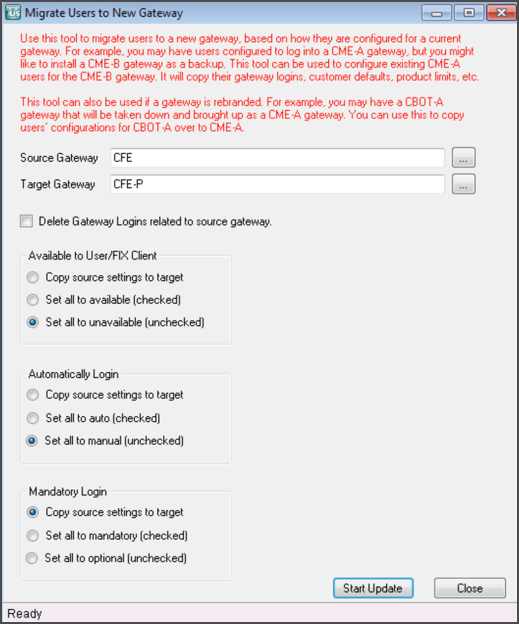 You can begin recording data from the new CFE Gateway following the migration. Will SODs be carried over or do I have to publish via X_RISK? If installing a new CFE Gateway, TT recommends closing all trader positions on the existing CFE Gateway before migrating to the new CFE Gateway. Users must manually enter SOD records for any outstanding CFE positions. How Do I Migrate Traders in TT User Setup? Can traders use their existing trader IDs on the new CFE Gateway? Advanced Prep - Create new flavors by copying from existing Gateways for the Go-Live weekend. On or after February 23rd - Enable new flavors and disable old flavors. Update the “Connection” values in Customer Defaults if it is used. Post Go-Live - Delete existing (old) flavors from TT User Setup after the exchange announces the final decision for go-live. Prior to the go-live, go to Server Admin | Migrate Users to New Gateway. Uncheck “Delete Gateway Logins related to source gateway” to leave existing (old) flavors, and use “Set all to unavailable (unchecked)” and “Set all to manual (unchecked)”. The Source,Target and setting information in the following image are for example purposes only. After the close on February 23rd, disable the old Gateway flavors and enable the new flavors from User Admin | User’s Gateway Login Attributes | Filter on a flavor | Select All Rows | Edit. Filter on the old gateway flavors and disable them by unchecking “Available to User” “Available to FIX Client” and “Automatically Login”. When this is complete, click Save. Filter on the new gateway flavors and enable them by checking “Available to User”, “Available to FIX Client”, and “Automatically Login”, When this is complete, click Save. The step above covers Gateway Login, Gateway Login Product Limits, Account Based Product Limits, and Customer Defaults, except for the “Connection” field in Customer Defaults. The “Connection” field has to be updated manually. 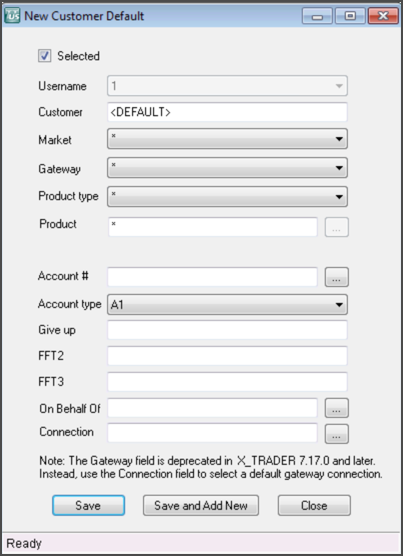 To find out if “Connection” is configured, go to User Admin | X_TRADER Customer Defaults, and ensure “Conn Gateway” and other “Conn xxxx” fields are empty. Delete existing (old) flavors from TT User Setup after the exchange announces the final decision for go-live. The steps are the same as above for Single Broker ASP, except that migration of the existing gateway flavors to the new gateway flavors will be handled by TT. After close of trading on February 23rd - Enable new flavors and disable old flavors. Update “Connection” in Customer Defaults if it is used. For detailed instructions, see the previous section. How do I migrate product limits under Gateway Login? When you use the "Migrate Users to New Gateways" procedure, this will migrate all Product Limits copied to the new gateway flavor. What is the impact to API Applications? Are there changes to various API fields? Customers are encouraged to perform testing prior to the launch to ensure that no other tags have changed which might impact their applications. What is the impact to CFE products? What is the minimum version of TTAPI/X_TRADER API? There are no dependencies that are version-specific due to the upgrade to the new CFE platform. How does this migration impact existing FIX Adapter users? Prior to migration, traders must cancel all working orders, including GTC, GTD, and GTDate orders entered for CFE products. The exchange will not migrate any working orders to new CFE. Customers should adjust TTChron on FIX Adapters to correctly handle the new exchange schedule. What is the FIX Client Impact? Is there impact to FIX Adapter logins in TT User Setup? You must update all FIX Adapter Client and Server Gateway Logins with correct logins as necessary. 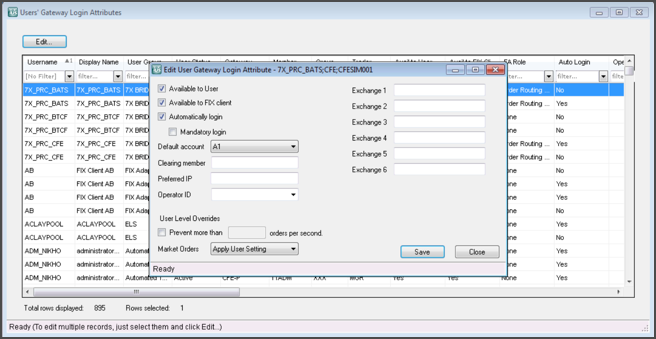 CFE is issuing all new sessions to customers for use on the new CFE API, so new gateway logins are required. Can I migrate existing trader positions? How do I handle Position Management during migration? Customers must delete all working orders prior to the uninstall and reinstall of the CFE 7.18.x gateway. Positions for CFE products will not persist to the new CFE Gateway. TT recommends closing all trader positions on the existing CFE Gateway before migrating to the new CFE Gateway. Users must manually enter SOD records for any outstanding CFE positions. Note: Pre-migration fills will not be retrieved from the old CFE Gateway. After the migration, new *bof.tbl and *fills.tbl files will be created. Can I use Auto-SOD with the CFE Gateway? If Auto-Calculate-SOD was enabled on the existing CFE Gateway, ensure that it is enabled on new CFE Gateway after installation. As long as the Fill Server rollover times are the same for all products traded on the CFE Gateway, you can use the Auto-Calculate-SOD functionality after the migration. Can GTC, GTD, and GTDate orders remain working in the market during the migration? WARNING: As part of the migration, CFE traders must delete all working orders and resubmit them on the newly installed CFE Gateway. This includes all synthetic and native orders submitted for CFE contracts on Synthetic Strategy Engine and Autospreader® Strategy Engine servers. At the end of the trading session prior to migration, traders must cancel all GTC orders that were submitted prior to the close on February 23. After the migration is complete, traders should re-submit their GTC orders for CFE products, including for synthetic orders. WARNING: The exchange will not migrate any orders to the new platform. Start the CFE Gateway prior to the first trading session in order to download settlement prices from the exchange. Have traders connected to the CFE Gateway resubmit their GTC, GTD, and GTDate orders for CFE products. For CFE Gateways connected to Strategy Engines, have traders resubmit their GTC, GTD, and GTDate spread orders to the Autospreader SE and synthetic orders to the Synthetic SE for CFE products. What is the FMDS Impact? What configuration changes are required to FMDS? None. Neither product names nor series keys are changing as a result of this migration. What is the recommended FMDS Version? TT recommends users upgrade to FMDS Version 7.6.4.5p26 for 32bit, 7.6.4.5p29 for 64bit or higher. What is the TT Gateway Impact? Exchange credentials such as IP and different IDs as mentioned below. It should not have a password as the authentication is based on the IP address. Account code mapping based on the CTI code and Order capacity. There are separate fields for Account Type (Customer/Firm) and CTI code (1, 2, 3, 4). The mapping is different than the current CFE Gateways. The following table shows the mapping of TT Account types with the new CTI code and Order Capacity for CFE Bats. It also provides a reference to the corresponding old CFE Account types. The derivation is the combination of CTI and Order Capacity. The Order Server uses the FIX protocol for order entry. The GIVEUP field is used for the CMTA number, which is populated in FIX Tag 439. The FFT3 field is used for the “SubAccount” and is populated in Fix Tag 440. If configured in Hostinfo, FFT4 will be used for “SubAccount” instead of FFT3 for customers. If there is no configuration in Hostinfo, FFT3 will be used to populate the "SubAccount." The FFT2 field is used for OnBehalfOfCompID (EFID) and will populate Fix Tag 115. This a mandatory field for order routing. Market orders and Stop Limit orders are not supported for Spread products. The CFE will reset sequence numbers daily, between 4:00 pm and 4:45 pm Central time. Order Entry Operator ID/ ATS Operator ID (tag 25004) and Manual Order indicator ((Tag 1028) will both be required fields. Matched Trade Prevention instructions will be an order-by-order basis. Tag 7928 will be used to populate the instruction. The user has to enter one letter for each category (3rd category is optional). For example: NF1, OMa, BF, etc. Spread order entry will be conforming to standard futures pricing. The credit Debit designations will not be used. Cancel-Replace/Order update handling will conform to standard FIX handling where an OrderQty delta is calculated and applied to LeavesQty. This leaves the user in total control of contract quantity exposure when the modification request overlaps partial fills for the order. Bandwidth restrictions (orders per second) will be substantially higher, i.e., 3000 msg/sec. Price limits will be in effect during extended trading hours. Orders to buy above the upper limit or to sell below the lower limit will be rejected when the limits are in effect. Below is the summary of the above settings for customer defaults fields. The customer defaults need to be set up correctly to satisfy the requirements for the new API. How do I configure the Price Server? The Hostinfo file must be configured with appropriate production credentials to establish the connection for market data. The Gap Request Proxy (GRP) port configuration is required to recover missing data and for message retransmission. The SPIN port configuration is required to fetch the current snapshot of the book at that point of time. CFE participants will need to use CFE multicast PITCH to receive real-time depth of the book quotations and execution information from CFE. All versions of Multicast PITCH feed will be WAN-shapes (maximum 100 Mb/s) and will be available from CFE data centers. The CFE Multicast PITCH and TOP Trading Status message type is used to indicate a current trading status of an instrument and will be sent whenever a instrument’s trading status changes. Gap Request Proxy (GRP) message is used to request delivery of the missed sequenced data by establishing TCP connection to a multicast PITCH GRP port. The SPIN server allows participants to connect via TCP and receive a snapshot of inside book and symbols with limited trading conditions on that unit. This is for the purpose of requesting the current CFE book in the middle of the trading session. Settlement prices will be disseminated for each futures product as soon as they are available. There will be no wait until settlement prices for all products are calculated. What is the Impact to Algo Design Lab (ADL)? What is the impact to existing algo templates? How does this affect ‘persisted’ algo templates? What is the impact to Strategy Engines connected to the new CFE Gateway? Autospreader® SE, Algo SE, and Synthetic SE servers connected to CFE Gateways in your trading environment are not impacted. Do I have to make configuration changes to the SE servers? No configuration changes for Synthetic SE will be needed unless the gateway flavor will change as a result of the API upgrade. What about working orders on SEs for CFE contracts? Prior to migrating to the new CFE Gateway, traders must delete all working native and synthetic orders submitted for CFE contracts on a Synthetic Strategy Engine, Algo SE, or Autospreader® Strategy Engine server.